This story doesn’t actually occur in the life of Loretta but is another one that I wanted to write about anyway. So the family drove up to the Hunter Valley on the weekend so we could go to snowtime in the garden. It’s much closer than the snowy mountains and at this stage my son only wants to play with snow rather than learn skiing. So it’s a much better option for us right now. There were huge snowpits where you can build snowmen, snowcastles or snow whatever. And then there was a designated snow fight area where snowballs were flying everywhere. And then there were toboggan slides and a big ice skating rink too. To sum up lots of fun was had. Anyway I’m not much of a driver anymore. For the past 10 years I think I’ve ridden my bike further than I drive each year. So long distance driving is a challenge for me. And even though the hunter isn’t really that far away, it is for me. So on the way home we decided to detour to The Entrance for lunch and to see the pelican feeding. That took us off the motorway and onto smaller roads. Now the roads weren’t bad or too twisty, but for some reason it was making me nauseous. So I was very glad to get there and get out of the car. We walked over to the main plaza area and found a pizza and pasta restaurant where we could have lunch. I still wasn’t feeling good but thought I should have some lunch anyway. Our waiter must have been trying to shock it out of me as he knocked over a water bottle straight on top of a glass and smashed it to smithereens. There was glass everywhere and we had to move tables. Good thing we hadn’t even ordered yet as any food would have been inedible. Sadly I was still feeling nauseous. A nice mushroom pizza with olives, and some pepperoni pizza and some spaghetti later and I was full. However I was still no good. So we wandered over to where the pelican feeding was going to be and even though it was still another 45 minutes to go there were already people waiting. I decided to join them so I could sit down and hopefully start to feel better. Besides these were the last front row seats.. Or rather rock steps, and right next to the water where we had a birds eye view of the pelicans jumping out of the water onto the feeding area. We were so close they were landing right next to us and splashing us in the process. If we wanted to, we could reach out and touch them if they would let us. So we were there early to get a great view. And they were there early so they could have the best chance of getting a fish! 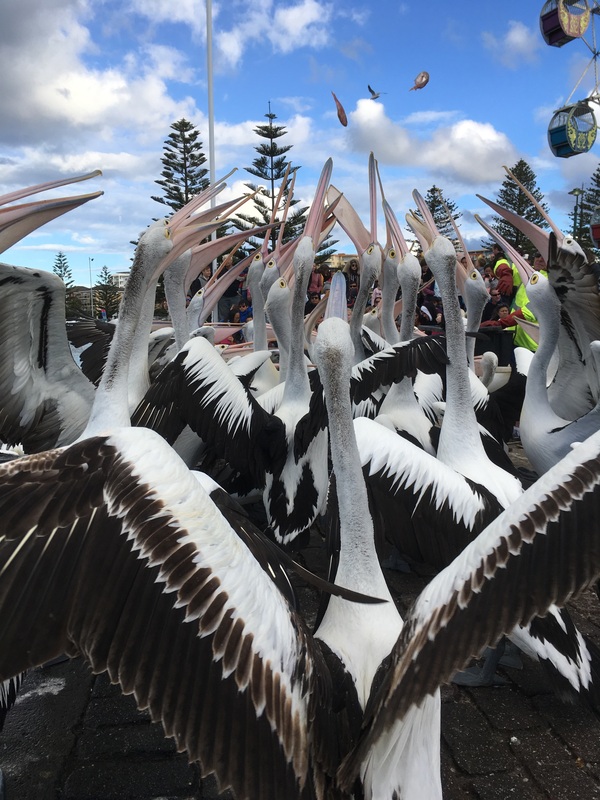 In the end there must have been a hundred pelicans there…..and a hundred people too! We waited and waited and got splashed and 💦 again. And we got to see them up close and personal. Maybe watching them poop was a little too close and personal…..ew! And finally the volunteers arrived with a tub of fish. Oh the pelicans were happy to see them! More and more pelicans hopped up onto the feeding area, splashing us in the process. And they were incredibly close, and they were hungry. They crowded around the box of fish waiting to be fed. Bob opened the lid and grabbed a fish. Three pelicans tried to stick their beaks in the box to get one for themselves. It was going to be a battle. Bob tried to feed a nearby pelican who grabbed the fish….and Bob’s hand! Fortunately his hand was in a thick glove and after much shaking he got his hand back. He didn’t seem to be worse for wear but it looked like he may have felt a bit more than a tickle. So Bob started throwing fish to save his hand. But each time he opened the box three beaks went in and the fight was on. And then there were so many pelicans up there that when he threw the fish, they all jumped. And when pelicans jump, they flap their wings. And because there’s so many pelicans and so many people watching them, when they flap they hit each other and anyone close enough. And there was no one closer than me. It was like I was in a boxing match. Except it was everyone against me. I had my arms up, protecting my head against every flap. My cap came in very useful as by holding onto both sides of the peak of my cap I had good protection for the top and side of my face. I took many blows (flaps) to the arms and body but luckily avoided the knockout blow. And then the fish were all eaten, we clapped our hands and the pelicans flew home. Bob still had both of his hands, and amazingly both his gloves and I was still in one piece. And for some strange reason I was no longer feeling nauseous. ‹ PreviousIs being transgender a blessing or is it a curse? just catching up. So funny!